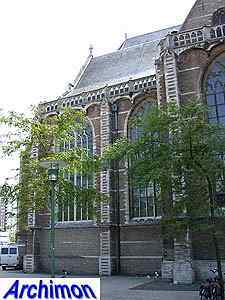 This church is known by several names. 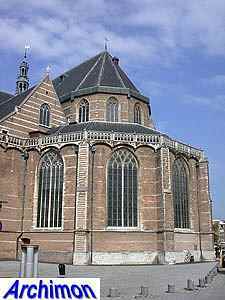 St. Laurens and St. Laurentius both remind of its catholic origins, while it has been also known as Grote Kerk ('great church') since it was confiscated and became a protestant church. 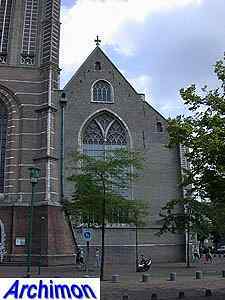 The history of this church started when Rotterdam was still a small town. 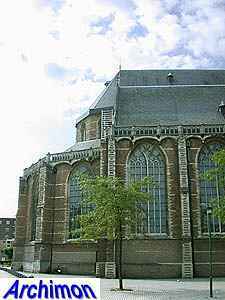 There had been a small church before, but in the year 1409 work started on a big church that could compete with the prestigious churches of Delft and Dordrecht, the current cruciform basilica. 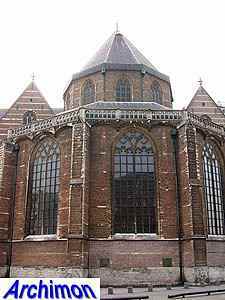 Instead of enlarging the old church the new one was built around it. 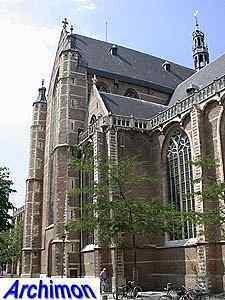 By 1436 the nave was largely completed, as was most of the northern transept-arm, and the first mass was held. 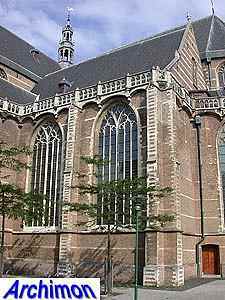 The choir was built in 1448 and the following years. 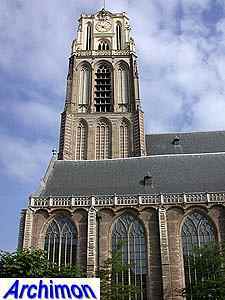 The tower followed in 1449 and was partly completed in 1460. 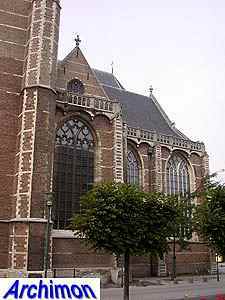 At that time it was seperated from the rest of the church by a canal, but that problem was eventually resolved. 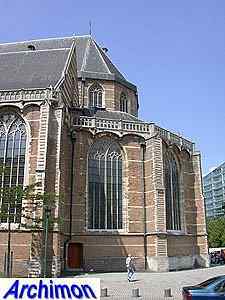 In 1461 the canal was filled in, and the nave was lengthened. 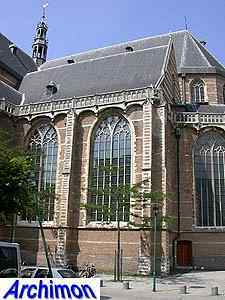 At the same time the southern transept-arm was built. 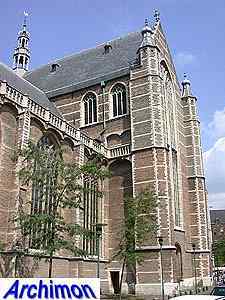 In 1488 work started on the ambulatory. It took until the year 1547 before work on the tower continued. By 1550 another segment had been added to it. 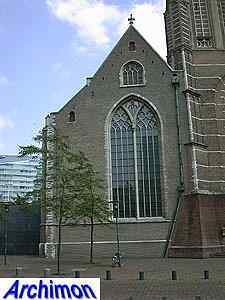 The church was built in a style closely related to Brabantine Gothicism. 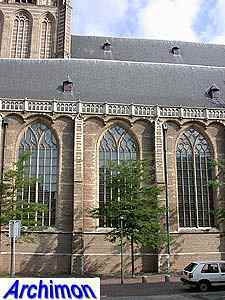 Unusual is how the side-aisles were given their own roofs, partly blocking the clerestorey from view and giving the church the look of a hall-church when seen from the front. 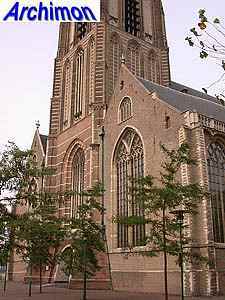 The church was built when Gothicism had been over its height. 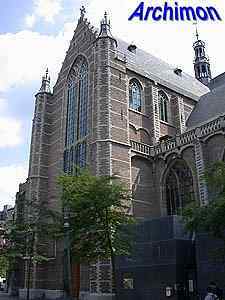 The master-builders who designed it and lead its construction had abandoned the verticality of classic Gothicism. 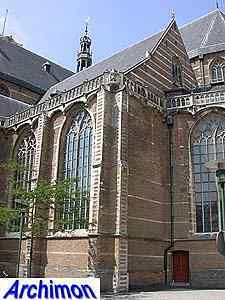 On the 12th of November 1572 the last catholic mass was held in the church, followed three days later by the first protestant service. 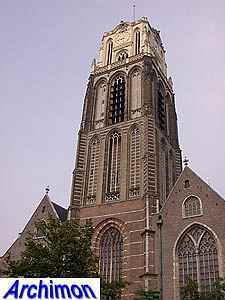 The war with Spain prevented the construction of a spire, but in 1615 Hendrick de Keyser made a design for one, which was built in 1621. In 1645 it was already removed because the wood had begun to rot. 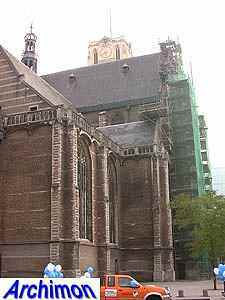 It was replaced by another segment, this time of natural stone, in a Gothic style that matched the rest of the tower better than the spire. The objection that this would be too heavy was overruled. 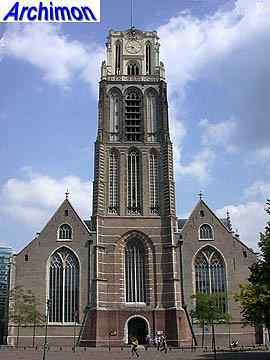 The tower however was sagging, and proved to be dangerous for the rest of the church during a storm in 1650. In the next five years work was carried out to set the tower straight again and to strengthen the foundation underneath it. 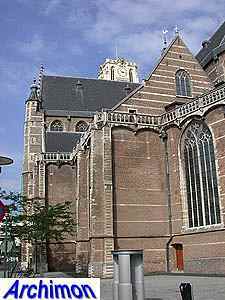 For almost three centuries little more changed on the exterior of the church. 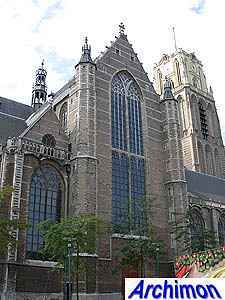 On the 14th of May 1940 German planes bombed the centre of Rotterdam. After the debris was removed what had been a crowded city was turned into a vast empty space, with only a few ruins left standing. One of these ruins was that of the old St. Laurentius. 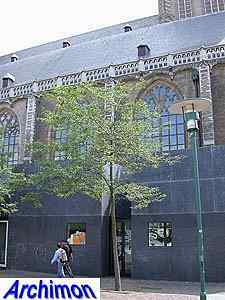 After the war functionalist architects rebuilt the centre. 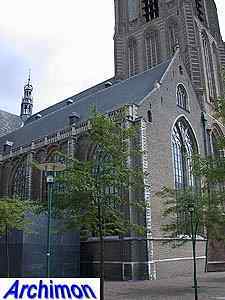 Despite their objections the old church was saved from demolitions, as the only church in the bombed part of the centre, and was completely restored from 1952 until 1968, although the functionalists did provide a sad environment of ugly modern buildings. 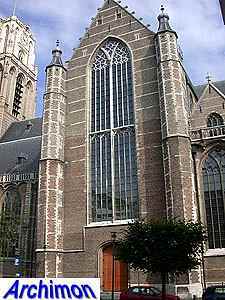 Today the church is all what is left of medieval Rotterdam. Modern skyscrapers now dominate the city's skyline.